The Office Scheduler is a wall-mounted information device capable of displaying the owner's schedule, playing back a greeting message, and recording voice messages from visitors. The device is designed to be mounted outside an office door in place of the usual name and room number plaque. Interaction with the device is done through an intuitive touch-screen interface on an LCD by pressing buttons on the screen. The heart of the system is the Atmel ATmega161 microcontroller. The microcontroller interfaces with the external SRAM schedule storage, the ADC for reading the touch screen, and the LCD screen over an 8-bit parallel bus. The audio portion of the design was handled by a Winbond/ISD audio chip with onboard storage. 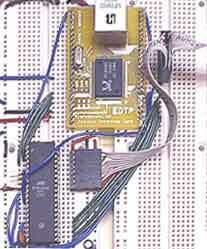 The microcontroller communicated with the ISD chip over an I2C bus implemented in software. Serial communication to the PC is performed through the microcontroller's onboard UART and an RS-232 transceiver. This project was created by a 3-person team for the Digital Design Capstone course in the University of Washington EE department. 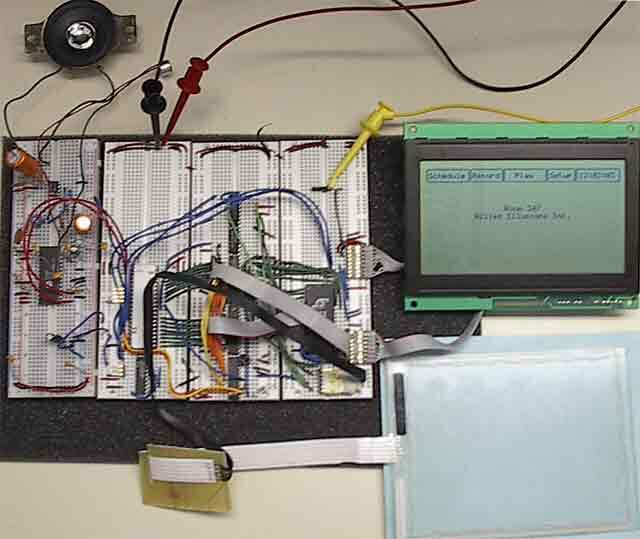 The AVR-GCC compiler and Atmel's AVR Studio were used for the microcontroller software development work. The final result is pictured here. The prototype was fully working and able to demonstrate all of the important features. The owner's schedule and device status could be monitored and updated through a Visual Basic application on the PC. One optional feature that did not make it into the prototype was communication over an Ethernet network. A small prototype was made containing only the code for communication over Ethernet using the UDP protocol. A microcontroller network interface card consisting of a Realtek Ethernet controller RJ-45 jack with integrated magnetics was used to connect the microcontroller to the network. Though the communication worked properly, and the Atmel processor could exchange data with the Visual Basic application, there was not enough program space left on the main prototype to include this feature.